It has been a winding road for Kayla Wentworth since she graduated from Taunton High. After helping the Tigers make not only their first-ever playoff appearance but also earn their first-ever state tournament victory, the talented goalkeeper had the opportunity to play Div. I college soccer. Playing for a Div. I program is the dream of just about every high school player that laces up their boots each fall, but the reality of playing at that level and the singular focus that many, if not most, Div. I programs require of their student-athletes isn’t for everyone. Sometimes, you just need to find the place where you feel comfortable and happy. After a year at Iona College (New Rochelle, N.Y.), where she admitted struggling with the coach, Wentworth gave Div. I a second chance with a transfer closer to home to play at UMass Lowell. She stayed for one semester in Lowell before making a second switch, heading to Beverly in the spring of 2018 to attend Endicott College. It is a move that has worked out on and off the pitch. Wentworth has certainly made the most of her time with the Gulls, earning a second team all-conference nod after leading the league with a 0.72 goals against average. She recorded six clean sheets in her first season with the Gulls and led Endicott to the top seed in the CCC tournament. When asked about the demands of playing at the Div. I level, Wentworth, who is a psychology major and wants to attend med school, noted that everything took a backseat to soccer. As much as she loves the game, she also had to be realistic about where her career was headed and the important of academics. 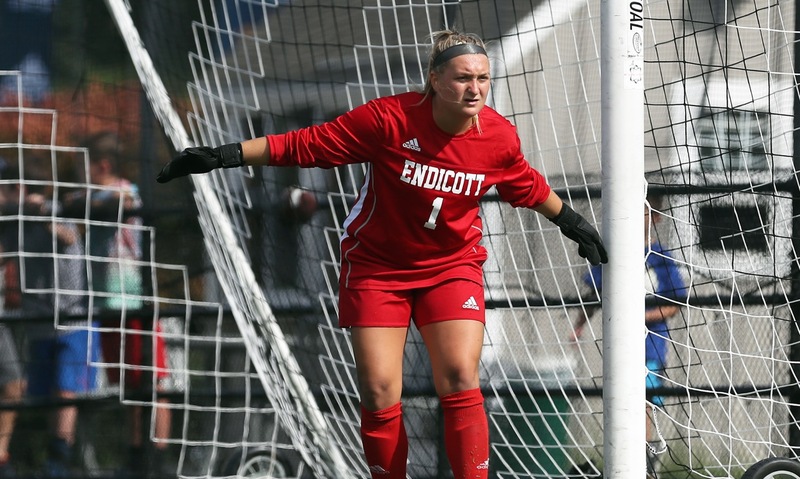 Unlike when she transferred to UMass Lowell, Wentworth joined Endicott in the spring. It afforded her the time to get acclimated with the campus, her classes, and with her new teammate. She took advantage of the extra time to become comfortable with her situation. She also benefited from being the lone goalie in the spring, with the Gulls adding two freshman to the roster this fall. For the first time since leaving Taunton, Wentworth had control of the No. 1 jersey and was between the posts for every game. All soccer players, but particularly goalkeepers, rely on confidence to perform at their best and Wentworth felt the confidence growing with each appearance. At the time of the interview, Wentworth was preparing for the tournament opener and she was counting on her high school experiences to help her handle playoff pressure. 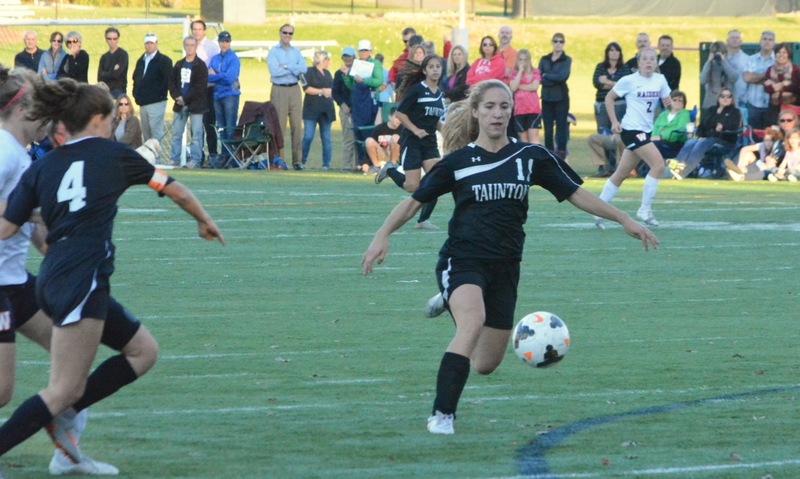 Wentworth was the goalie for the only Taunton girls’ team to make the postseason and she helped the Tigers go on the road to beat Wellesley for the program’s first playoff win. It is an experience that still resonates for the players that were part of it. Unfortunately, Endicott didn’t experience the same success in the tournament. The Gulls were beaten on penalties after 110 scoreless minutes, despite putting eight shots on goal and holding WNE to just one. It was the fourth straight year that the Gulls had the season end at the semifinal stage. It wasn’t the ending that Endicott was looking for, but Wentworth knows that the team is in a good place and, more importantly that she is too. After two years of searching for the right place to play, the best fit for her, Wentworth has found a home in Beverly and she is brimming with confidence after a successful fall. Attleboro heads into the 2015 season with a strong core of sophomores that have the Bombardiers thinking positive thoughts about the future, although this may be a season of growing pains. Paige Medeiros is back for Attleboro and the senior midfielder will be a key player for the Bombardiers as her set pieces have been one of their best sources for creating scoring chances. Head coach Steve Santos will also be hoping for positive contributions from Rebecca Entwistle and Kayla Merritt among other returning players. Attleboro also has several players bouncing back from serious injuries who could step right back into the lineup. Attleboro scored only eight goals a season ago and offense may be at a premium again this fall as the young players grow into their new roles. The Bombardiers will focus on pressuring the opposition and being tough to beat. Franklin reached its third consecutive Div. 1 South final last fall but couldn’t come through with a three-peat in an overtime loss to Whitman-Hanson. The Panthers lost several key pieces including two-time HockomockSports.com Player of the Year Taylor Cogliano, but remain among the favorites for the Kelley-Rex title. The Stowell twins, Assumption commits Victoria and Alexis, are two important players coming back for the Panthers in midfield and attack along with senior forward Bailey Knous, who has battled injuries during her career but when on the field can be prolific in front of goal. Also, junior Meg Adams is back and healthy, which will be a huge boost in the early season, and Megan Georges returns after a breakout season at attacking mid. Franklin was not only a strong offensive team but also one of the league’s best defensively and Geysen is counting on Lauren Rudolph and Meghan Dietrle to hold down the center of defense while young players step into roles on the outside. Geysen is confident his team is going to be solid, but he believes younger players are going to need to grow into new positions if the Panthers are going to get back to the sectional final. King Philip is waiting on a new turf field to be finished, but in the meantime will be battling the Kelley-Rex leaders and aiming for another spot in the postseason. The Warriors will return junior striker Rachel Hogan, who will be joined this fall by senior captain Makenzie Nickerson, who is returning after 1-1/2 years out with a knee injury and should be a big boost to the forward line. Maggie Hall will return for her second year in goal and Lauren Hehn and Kate Sexton are back to shore up the midfield and Brooke Thomas and Emma Corcoran will lead the defense. The Hornets took No. 1 seed to the brink in the quarterfinals last season before being knocked out of the playoffs. This year’s team will be missing several key pieces from that squad, but returns 14 players including several from the 2014 HockomockSports.com Second XI. Mansfield will be counting on junior Quinnipiac commit Hannah Reiter to continue her emergence as a star player in the Hock and to dominate in the midfield. Up top, the Hornets will have plenty of firepower with seniors Jackie Carchedi and Jen Kemp back after combining for 19 goals last fall. Defensively, Mansfield also has plenty coming back with Trish Murphy, Lindsey Dalton, and Anna Chiarolanza all returning. The top four scorers are all back for Mansfield and all but one of the starting back four. Head coach Kevin Smith also noted that the players who are returning have 2-3 years of experience at the varsity level and should be able to step right in to keep the Hornets among the top teams in the league. The Rocketeers were stunned in overtime by league rival Mansfield in the first round last year and will have a new coach with former JV coach Glen Pasquel taking over from Doug Wheldon. While there are plenty of changes for the Rocketeers this season, there was plenty of youth on last year’s team that could develop into top talents. North will look to senior Hana Caster for the primary scoring punch and Pasquel is pleased with the developing partnership up top between Caster and sophomore Haley Guertin. Grace Guertin is back in the midfield and Rachel Labonte will be moved back into defense to cover for the loss of Hannah Kane. Pasquel feels comfortable moving into his new role and hopes to instill a passing game that keeps the ball on the ground. He is also adding a sweeper/stopper system rather than a flat back four. Once again, North appears to be a team that can compete among the best in the league. Taunton earned plaudits for its growth under first-year head coach Edie Dixon last season, as the Tigers won six games and showed tenacity and competitiveness with everyone they played. This season, Taunton will return all but two starters and is eyeing a potential tournament berth. HockomockSports.com Second XI goalie Kayla Wentworth is among the returning players and will be expected to backstop the Tigers defense. Up top, the combination of Bristol-Plymouth transfer Alana Vincent and Sam Tichelaar will be back to provide a scoring punch and freshman Maggie Sullivan will be back in midfield after starting a couple of games as an eighth grader in 2014. Fresh off a national title with her club team this summer, last season’s Underclassman of the Year comes into the fall with high expectations and as the star player in the heart of a team that has the potential to bring home its third straight Davenport title. Last fall, as a sophomore, Calabraro recorded nine goals and 10 assists to lead the Tigers to the division title, while showing off her versatility as both a deep-lying midfielder and pushing forward to slot in behind the forwards. 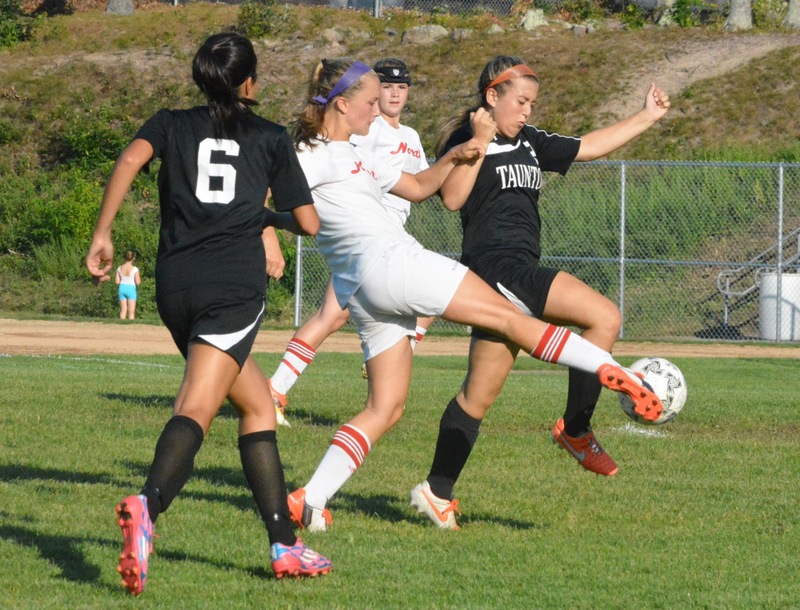 There are few surprises in the Hockomock and teams know to key on Calabraro to disrupt the OA midfield and it will be up to her to manage the defensive pressure and keep pushing the Tigers forward. The Hornets lost several key pieces from last year’s squad but Carchedi, the team’s leading point-getter, is returning and will once again try to combine with center forward Jen Kemp to provide Mansfield with a front line capable of challenging the top teams in the league and D1 South. Carchedi had eight goals and 14 assists in 2014 playing as a wide forward on the left side. Her speed, eye for a pass, and ability to cross accurately make her a constant threat on the edge, including he overtime goal that beat North Attleboro in the playoffs. As expected from the Defensive Player of the Year in basketball, Carchedi also provides great energy on the defensive side of the ball. One of the fastest players in the league, Caster provided the spark for the Rocketeers last fall that carried North into the tournament, including late goals to tie Foxboro on the road and an impressive performance that helped the Rocketeers knock off OA. North had a dramatic overtime loss in the tournament, but Caster will be back for her senior year with a strong cast of young players, including sophomore Haley Guertin, which could be set to make another tourney run. A typically soft-spoken forward and midfielder, Caster will need to be the team’s leader and use her pace and finishing to help the Rocketeers under first-year coach Glenn Pasquel. It seems like every time one Duserick leaves another is ready to step in for the Bulldogs. Brianna is currently playing at Stonehill, Hailee is a freshman at Providence, and last fall Riley stepped in as a freshman to play a key role down the stretch for Canton as it chased a tournament spot. Duserick stepped into the midfield and showed the ability to play the key forward pass or keep possession like a player with far more experience. 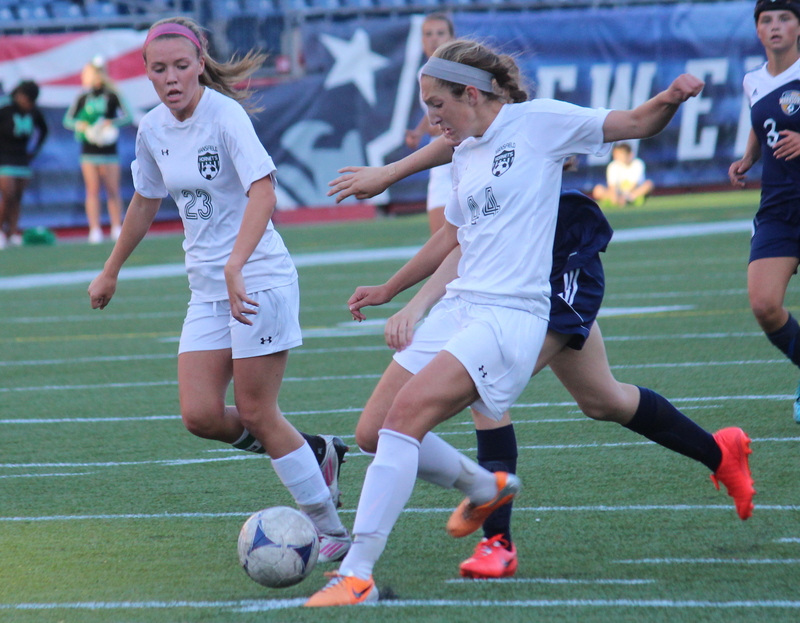 Her 40-yard shot into the top corner against Milford also showed that she took some other skills from her sisters. She was named an all-star by the Hockomock coaches and has great promise to repeat that this fall. The Warriors can be a team focused on the defensive side of the ball and making it difficult to play, but Hogan was able to create a spark on the other end of the pitch as well. Her speed forced defenses to stay honest and kept them from pushing too far forward. Hogan could also drop deep to collect the ball and her skill and strength made it difficult for teams to force turnovers. There were times that she was a little isolated up front, but she was always a willing runner to chase long passes forward. With KP adding a turf field, it may allow her skills to shine even more this year. Knous is a dynamic forward and one of the leading scorers for the Panthers, who reached a third straight sectional final last fall. Knous scored double digit goals again in 2014, despite occasionally battling injuries. When healthy, she can be one of the most prolific scorers in the Hockomock and fits into the Panthers style as a striker that can play on the shoulder of the last defender as well as drop in and allow the wide players to push forward. With Knous on the pitch as a focal point to the attack, Franklin looked more dangerous, as evidenced by the opening 15 minutes of the final against Whitman-Hanson when Franklin created chance after chance. This could be a big year for the senior. In a team filled with big name players, there were times that Reiter appeared to be flying under the radar, but then she would take the ball down in traffic, step by two defenders and either let loose with a shot or pick out a pass to spring a teammate. Her combination of size and skill made her stand out among a very talented and experienced midfield and this year she will be counted on to step into a leadership role with the Hornets losing both Melissa Bongarzone and Lindsey Bjorkman. Mansfield has talent returning, but Reiter, a Quinnipiac-commit, will be a central cog to how far the Hornets can go this fall playing multiple roles from playmaker to ball-winner for the Hornets. The Assumption-commit has continued to grow well beyond her stature and can dominate the game with her passing ability. Stowell rarely gives the ball away in midfield and, although she’s not the biggest midfielder in the league, can also get stuck in and win the ball back. The Panthers have an explosive attack and much of it stems from Stowell, a two-time HockomockSports.com Best XI choice, finding the right pass to unlock the defense. With Taylor Cogliano graduated, Stowell may be asked to push even further forward to help spring the attack. Sykes was outstanding in her rookie season in the Hockomock with more than 25 goals and more than 30 points for the Warriors, who finished second in the Davenport and reached the second round of the state tournament. The challenge for Sykes will be repeating and building on that incredible freshman form, but with her skill set, comfort on the ball, and ability to read the game in multiple positions in the midfield, expectations are very high for the Underclassman of the Year honorable mention and favorite for this year’s award. Taunton showed huge improvement under first-year head coach Edith Dixon, winning six games and staying competitive against some of the top teams in the league. One of the reasons for that continued improvement is the play of Wentworth, who has at times stood on her head to keep the Tigers in games and give them time to find goals on the other end. Beyond her save statistics, Wentworth inspired confidence in the defenders in front of her and was able to marshal the Taunton defense. As the Tigers continue to build the program, one more year of Wentworth in net will be a huge boost for Taunton’s hopes of reaching the postseason.